Retrieve the Staff of Magnus from the Marbruk vault. Queen Ayrenn must deal with the aftermath of her brother's betrayal and settle matters in Grahtwood. In the meantime, she asked me to travel to Marbruk, in Greenshade, and secure the Staff of Magnus from its vault. Find Captain Sarandil in Marbruk. Follow Captain Sarandil into the vault. Talk to Captain Sarandil in the Marbruk marketplace. Follow him into the Mages Guild. Inside the Mages Guild, enter the Primary Vault with the Captain. In the first room, he invites you to examine four rare plants, including Crimson Nirnroot. You can look at them, or you can just talk to the Captain. Either way, let him know when you are ready to continue. Enter the Relic Room with the Captain. This room holds Ayleid relics, including the Crown of Nenalata. Again, talk to the Captain to move on. In the final room, you try to take the Staff of Magnus, but it disappears when you touch it. You ask the Captain who had recently entered the vault. Vicereeve Pelidil toured the vault and has the ability to produce a strong illusion. The Captain checks with the watch outside the vault. You and the vicereeve were the only people to enter the vault. The vicereeve went into the wilderness with "orders from the queen to care for the late Prince Naemon's body." You volunteer to tell the queen about this. A herald enters the guild after you finish saying this and announces the queen's arrival. Talk to the Queen outside the Mages Guild to receive your reward. 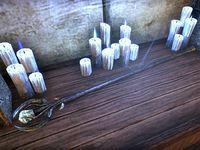 The person who gives you this quest may vary depending on which quests you have completed previously: Queen Ayrenn will offer it once you complete the story of Grahtwood with The Orrery of Elden Root; if you have not completed this and journey to Marbruk on your own, you will meet Hazazi when you enter the city. Finally, Razum-dar will appear with this quest in a number of story-related places in Greenshade, such as Woodhearth or Driladan Pass, if you enter them before starting it. This page was last modified on 20 February 2019, at 17:10.